With so much terrible things happening in the news right now, from threats of nuclear war to several high-profile cases of sexual harassment and abuse, the world needs a bright ray of hope and optimism to reassure them that there is still good in this world… and I’m not talking about the Justice League (wait for that review next week), but rather a small bear with a red hat, blue coat, and endless marmalade addiction. Yes, Paddington Bear is back in a sequel to the smash-hit 2014 film that made him a beloved British icon once again, and if that wasn’t good enough news then the fact that it’s just as wondrous, funny, and absolutely heartwarming as its predecessor should overcloud that. We pick up on Paddington (once again voiced by Ben Whishaw) as he’s now firmly settled into his local community, living with the Brown family (Hugh Bonneville, Sally Hawkins, Madeleine Harris, Samuel Joslin, and Julie Walters) and generally making everyone’s lives all that much happier. He’s keen to find the perfect birthday gift for his Aunt Lucy (Imelda Staunton) to celebrate her 100th birthday, and happens upon a rare pop-up book of London’s most famous landmarks which he becomes determined to buy through a series of odd jobs. 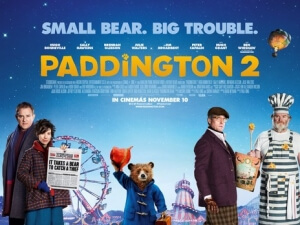 However, when the book is stolen by vain and narcissistic actor Phoenix Buchanan (Hugh Grant) for more nefarious reasons, Paddington is framed for the crime and thrown into prison, where he tries to befriend fellow inmates like temperamental cook Knuckles McGinty (Brendan Gleeson) while the Browns work hard to clear his name and catch the real culprit. All throughout the film, even in its sadder moments, there is always a sense of wonder and perfectly balanced whimsy that holds your hand as it guides you through this alternate view of modern day London. After all, in this universe where apparently bears can talk and walk around on two legs making marmalade, newsagents live in fancy houses, steam trains regularly depart from stations, and prisons operate like they would in The Grand Budapest Hotel, right down to the striped uniforms and lack of security cameras. None of this suggests we’re in any kind of reality here, but you just go along with it because you’re having such a good time being in this world, and quite frankly finding things like that to complain about in a film as good as this just makes you a bitter and cynical human being. Watching this world operate and acted out in the way that it is reminds one of Mary Poppins and how positive the majority of the characters appear to be, or to link more into the plot of this movie something like The Great Muppet Caper, which like this film took plenty of time to set up a situation and set of characters that managed to be utterly delightful from beginning to end. It’s a world you wouldn’t mind at all spending more than a few days in, primarily because the characters are so lovable and the environments so inviting that you can’t help but desire more time in this place. Paddington is, as ever, an adorable creation whose optimism and genuine warmth (emphasised by Whishaw’s sweet and innocent delivery) is sure to melt even the most cold-hearted of people, and even proceeds to do so at several points in this movie, and the CGI work on him is beautifully understated, making him look and feel like he’s really there when we know for a fact that he (sadly) isn’t. Other characters both old and new, from the Brown clan to the numerous fellow occupants of Windsor Gardens, each have their moment to shine, though it is the newer characters that end up leaving the biggest impression. Gleeson gets quite a few memorable moments that just about make up for his participation in Hampstead earlier this year, but it is Grant, who is having an utter ball in every scene he’s in, who is the true human standout; essentially parodying himself as this vain, self-obsessed actor who’s fallen from grace and determined to get back on top at any cost, he gets to have tons of fun dressing up in several costumes – ranging from a nun to a homeless man to even a medieval knight – and adopting even more over-the-top accents that all work well in getting a solid laugh from just his ridiculousness alone. Again, this is a world where even the villains are oodles of fun to be around, almost as much as the central character and his endless charm and sweet-natured naivety. Ultimately, this is a positive family experience where everyone can get something of value from the youngest child to the oldest parent or grandparent, with laughs aplenty and a great deal of heart and genuine warmth that will leave you with the biggest grin on your face as you leave the cinema. The first Paddington was a genuine surprise after a few underwhelming trailers, while Paddington 2 is just as shocking in its ability to provide everything the first film offered and more, while also proving that in a world where horrible things are happening left and right, all we needed was a CGI bear that loves marmalade to remind us that, even in the darkest of hours, there is still a presence of good that acts as a much-needed beacon of light waiting to help us all out. Paddington 2 is an utterly delightful family sequel that retains its predecessor’s warm heart and lovable characters, with a few new exciting additions that really emphasise the surreal but inviting world it all takes place in, including Hugh Grant who is having the time of his life here, and helps the film act as a much-needed antidote to all the negativity going on in the real world right now.